With the visit of our Music Man, our day got a bit rushed by skill time. I had wanted to roll playdoh and make a square with the snakes, but we didn't have time. We all got our laminated squares and sang our song. We talked about the many different things that could be squares. 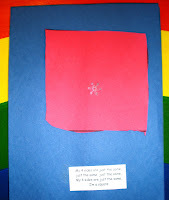 The children thought of; books, pictures, windows, chair seats, tables, blocks. One little boy said heads, which we worked around--but I thought it was very funny. After our discussion we traveled the room again looking for squares then headed to the tables to make our second page for our Shape Book. 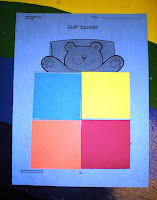 Today we made a quilt with four small squares that when put together made a big square too. I had a picture run off and the children glued the four square pieces on. That's really a really cute idea for the quilt! My girls like going on a shape walk around the block. I just thought of another idea- hide the shape and the kids can try to find all of the hidden squares. Just something my 4 yr. old would like! She had me hiding our counter bears the other day and enjoyed searching for them! Oool. I just thought of somthing else. 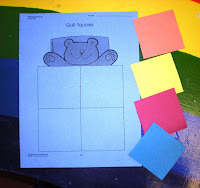 If your not finished with squares, each child can decorate a square and you could make a class quilt like the bears!! It's neat to see all of the kids work together. Ok- I'm done rambling. Have a great day!! I'm glad that you like the ideas! 2 and 1/2 hrs does go by so fast. My daughter's preschool teachers says that all of the time! She wants to do so much, but there just isn't enough time. That's neat that you are doing the mitten. Isn't it such a cute story?